Martin Scorsese has done it with both Robert De Niro and Leonardo DiCaprio, Quentin Tarantino with Samuel L Jackson, Tim Burton with Johnny Depp and Helena Bonham Carter, and Steven Spielberg with Kathleen Kennedy. Now Ireland’s answer to a filmmaking tag-team, director Lenny Abrahamson and Ed Guiney, producer and co-founder of Element Pictures with Andrew Lowe, are making Irish film history, by not just teaming up for their fourth feature film, but celebrating a staggering 10 nominations for their last feature film ‘What Richard Did’. Betting men and women are backing the 2012 drama to go all the way at this year’s ceremony, with nominations in the Best Film, Best Script, Best Actor and Best Director categories, among others. Element Pictures also dominates the awards, with 20 nominations across both film and TV categories. For a duo that have known each other for more than 30 years, it may seem odd that ‘What Richard Did’ is only Lenny and Ed’s third feature film collaboration, having also worked on TV series ‘Prosperity’ together in 2007. 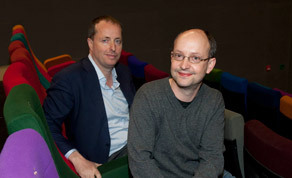 We were obviously concerned about its genesis but we were not interested at all in talking about any real life events that the book was based on "
Their first collaborative effort, 2004’s ‘Adam & Paul’, earned Abrahamson a Best Director IFTA, while the film was nominated in an additional seven categories. It was another three years later that ‘Garage’ was released, earning 11 IFTA nominations, a record still held by the project today. Despite teaming up as far back as the 80s to set up a video production society in Trinity College, and working together on Lenny’s first film, '3 Joes', and even renting out the same production space some years later, the duo’s friendship preceded their working relationship until the early noughties. “We grew up in similar circles in Dublin and kind of knew each other, so we go back a long way, in fact I think the very first film we made was a documentary about Lenny’s grandfather, which we shot in the old IFI before it was turned into the IFI, which Lenny and myself and Stephen [Rennicks] were all involved in,” says Guiney. “Lenny is just phenomenally gifted, a wonderful person to work with, he makes really fantastic films, but he’s also very clear about what he wants; he’s very inclusive, and he creates a very constructive environment to work in. I’m spoiled working with him, I really love it,” adds Guiney. So how did ‘What Richard Did’, the film that’s not based on the book that’s not based on the real-life events of the 2000 Club Anabel incident, take not only the Irish public by storm, but get named ‘Film of the Week’ by the BFI upon its UK release, earn lead actor Jack Reynor a place on WME talent agency’s books, as well as a role in Michael Bay’s ‘Transformers’, column inches in The Guardian for Abrahamson, and posters all over the London tube? “The way it happened was, I read the book and optioned it, thought it was interesting, and I gave it to Len, as I would, if I came across anything I thought might be of interest to him. And he liked it, and then Emma Norton, who is our head of development [at Element Pictures], is married to Malcolm Campbell (writer), and Malcolm picked up the book and was really interested in it and he had a good take on it, so it came together very easily, very organically,” says Guiney. “We were obviously concerned about its genesis but we were not interested at all in talking about any real life events that the book was based on, and in fact, we set out to move further away from any kind of coincidences in terms of story or anything like that. Obviously the fact that the story is completely contemporary differs it, but, it’s similar worlds and in some ways similar events in the middle of it, but in terms of characters and storyline and how things happened and what the fall out was, it’s completely different,” he adds. Casting director Louise Kiely scouted potential actors in schools and colleges around south Dublin, and showed producer Guiney and director Abrahamson audition tapes of Reynor initially. Despite workshopping a number of actors for the part, the production team decided to go back to their first choice, and cast a then teenage Reynor in the role that, subsequently, would change his life. Lenny manages to get to the heart of his characters, and it’s just utter truthfulness "
And it is with this truthfulness that the Abrahamson and Guiney team have decided to join forces again for the upcoming feature ‘Frank’, which will begin shooting in Ireland this week after a three-week stint in New Mexico. For ‘Frank’, Guiney has managed to cast another Irish actor of the moment, Domhnall Gleeson, as well as Irish-German star Michael Fassbender and Oscar-nominee Maggie Gyllenhaal. This should come as no surprise however, as Element Pictures projects have never been sort of international talent, with its TV series ‘Ripper Street’, also up for four IFTA’s, including Production Design and Costume for Irish crew Mark Geraghty and Lorna Marie Mugan, starring Matthew Macfadyen, Jerome Flynn and Adam Rothenberg. “On something like ‘Ripper Street’ where we’re the Irish co-producer, we’re not editorially involved in that show, that’s very much Tiger Aspect and Lookout Point. They’re the main people there, so we’re delighted to be in that project with them, but they’re the driving forces behind it. “I don’t know if there’s any secret, we’re only as good as the films we work on and the programmes we’re associated with, whether that’s ‘What Richard Did’ or ‘Shadow Dancer’, when we’re fully involved, or if we have a talent, it’s for putting interesting voices and interesting filmmakers in projects and getting behind them and helping to get them made,” says Guiney. Element’s other feature released in 2012 is ‘Shadow Dancer’, which is also up for four IFTA’s, including Best Film, making it direct competition to ‘What Richard Did’. Another two nominees in that category, ‘Grabbers’ and ‘Death of a Superhero’, were distributed by Element, while ‘Good Vibrations’ is a Canderblinks production. Now that Element Pictures has conquered the development, producing, and distribution divisions of the industry, even going so far to open its own cinema, will Guiney and his business partner Andrew Lower ever branch out to any other side of the business? “We definitely won’t branch out to post-production, I’m certain of that. I think what we want to do is, we obviously make television drama, we’re doing ‘Quirke’ at the moment, with the BBC and Tyrone Productions, and we want to do more television drama. We expect that we will, and we obviously have a track record in that, we’ve done a lot for RTÉ in the past, and for BBC and Channel 4, but we want to grow that part of that business. We obviously want to grow our distribution business and our exhibition business and I suppose in a way continue to internationalise,” says Guiney. Who knows, maybe 2014 will see Abrahamson and Guiney’s ‘Frank’ battle it out for Best Film at the Academy Awards against Scorsese’s ‘Wolf of Wall Street’, Burton’s ‘Big Eyes’ or Spielberg’s ‘Jurassic Park’. The 2013 IFTA Awards take place at the Convention Centre in Dublin on February 9. See the full list of nominees here.